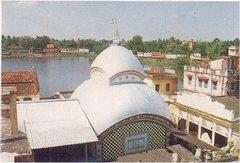 Taraknath Temple of Tarakeshwar is one of the prominent pilgrimage centers in Bengal. Tarakeshwar is located near Serampore near Calcutta in Bengal. This temple dates back to the 18th century. Legend has it that a devotee by name Vishnu Das emigrated with his clan from Oude (Ayodhya) and was viewed with suspicion by the locals. It is believed that he proved his innocence by holding in his hand a red hot iron bar. Later, his brother discovered a site in the nearby jungle, where cattle discharged the contents of their udders (milk) at a particular spot each day. Upon investigation, they discovered a Shivalingam. A dream is said to have revealed to them that this Shivalingam was a manifestation of Tarakeshwar - Lord Shiva ... the Param Bramh... the primordial and ultimate force of the universe...the source of everything. A temple was built at this spot, and was renovated in subsequent years. Tarakeswar (Bengali: তারকেশ্বর Tarokeshshor) is a town and a municipality in Hooghly District in the Indian state of West Bengal. It is a police station in Chandannagar subdivision. Tarakeswar is a renowned place of pilgrimage and the greatest centre of the Shiva sect in West Bengal. 58 km away from Kolkata, Tarakeswar can be reached conveniently by train. The principal attraction is the temple of Taraknath, an 'atchala' structure with a 'natmandir' in front. Close by are the shrines of Kali and Lakshmi-Narayan. Dudhpukur, a tank to the north of the Shiva temple is believed to fulfil the prayers of those taking a dip in it. Pilgrims visit the temple throughout the year, especially on Mondays. But thousands of pilgrims visit Tarakeswar on the occasions of 'Shivaratri' and 'Gajan', the former taking place in Falgun (Feb-March) while the latter lasts for five days ending on the last day of Chaitra (mid-April). The month of Sravana (mid-July to mid-August) is auspicious for Shiva when celebrations are held on each Monday.